Whether you can’t go without your morning coffee, or you want to snuggle up on the couch with a hot chocolate on a Sunday evening, there’s one tool that will make your life that little bit easier – the kettle. “I’ll put the kettle on” is a phrase many of us love to hear and there’s not much a good old cup of tea and a natter can’t solve, but if your kettle is a not up to scratch you could end up with something that looks and tastes more like dirty dishwater. But what makes a good kettle? Many would assume that a kettle simply boils water and that’s that. However, in this day and age there’s quite a bit of technology packed into these simple little gadgets. To help you decide, we’ve compiled a list of the best kettles 2018 has to offer. If you live in a hard water area, your saving grace will be a kettle with an integrated filter for the freshest results. A filter will also help reduce limescale and make it easy to clean. If you’re an early riser, then look for a kettle that is quiet to boil so you don’t wake up the entire house, or if you tend to wander off and forget about your brew, choose a kettle that whistles when it boils. Further to this, some kettles have a ‘keep warm’ function so that you don’t have to keep re-boiling if you forget. The Breville VKJ797 Brita Filter Kettle is a great option for all homes, but is ultimately one of the best kettles for hard water. The filter will ensure you get only the freshest boiled water when making your morning tea or coffee, and the BRITA technology is also great for the prevention of limescale build up. You will have to replace the filter every now and then but this will this make the water taste better and prolong the life of your kettle. It’s a stylish kettle with an illuminated water window that lights up blue when boiled and an auto switch off feature once the kettle is empty. It comes in a few different colours that would suit most contemporary kitchens. If you are looking for a new kettle because limescale has destroyed your current one, this is the ideal choice. Do you ever boil the kettle, walk out of the room to do something else and return forty-five minutes later only to boil it again? They say a watched pot never boils, but you can rest assured that when you leave this kettle it will keep your water warm up to 30 minutes after boiling so you can have your brew when you’re ready. This is one of the best kettles for boiling water at different temperatures. Unlike any other kettle, it has 4 temperature settings so that you can find the right one for you; perfect for making hot chocolates for the little ones that won’t burn their tongues. It has a quiet boil but does whistle once it’s done which is also handy if you’re out of the room, and its filter means you’ll get the freshest results when making your favourite hot drink. This striking red kettle is one for the interior design lovers. Featuring chrome accents and a 360 degree swivel base, this kettle would fit perfectly in a modern kitchen. It’s more than just a pretty face though. 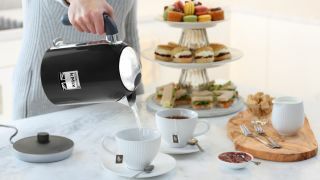 This De’Longhi Avvolta Kettle has a generous 1.7L capacity which is perfect for a tea break with friends. Although a little pricey, this kettle comes with a filter which will help prevent limescale and prolong its lifespan. For anyone looking to freshen up the kitchen with a new kettle and toaster set that looks the part and stands the test of time, the De'Longhi Avvolta range is a perfect choice. The Dualit 72402 Cordless Jug Kettle has a range of features including large heatproof lid, finger guard, cordless swivel base and large water windows...ultimately, lots of handy additions which make it safe and easy to use for all the family. Depending on the colour you want this kettle varies in price so you might find that your choice of kitchen decor will have you digging a little deeper into your pockets for this kettle. It does not have an integrated filter, which makes it a better choice for those in soft water areas, but it is one of the more stylish, classic pieces on this list. The Dualit Classic Kettle is a great investment that will provide you with many years of service. Although pricey, this kettle has a repairable element, which means years down the line when it stops working as well as it should, the heating mechanism can simply be replaced at a fraction of the cost of a new appliance. This is great if you want to invest in the matching kitchen appliances available, like the Dualit Classic Toaster, because you won’t have to change your whole set if one item breaks. This kettle is cordless with a swivel base and also comes with a whisper boil feature, making it far quieter than other models. We think it’s perfect for contemporary kitchens and anyone looking to invest in a good quality, quiet kettle. This Kate Spade Stovetop Kettle is a winner for its cute design. It comes in a beautiful gift box and features the words “whistle while you work” on the spout, making this an ideal whimsical gift. Perhaps seen as a novelty item to some, we believe it would make an ideal housewarming gift or Christmas gift for someone who loves the retro look. Although this kettle may not be the most efficient option and it is missing pretty much all of the gadgetry of the other kettles on this list, it is the best kettle for gas stoves and perfect for those who like to do things the old fashioned way. If you really fancy an iconic Smeg Fridge but you are not sure you wallet can taking that much of a bashing yet, why not start off with The Smeg KLF11 Kettle for a fraction of the price? This is the must have retro kitchen gadget that was designed with both aesthetics and functionality in mind. It has a beautiful stainless steel design that comes in a wide range of pastel colours, so there is one for every kitchen, and you can purchase matching products so you have a complete set. The ‘SMEG’ lettering has been known to wear off after some time, but in terms of function it won’t let you down. For big families or those who like to play host, this kettle has a large 1.7L capacity which can make up to 6 cups in one boil. Although a little pricey, this kettle is easy to clean and maintain with its removable limescale filter which will make it last longer than standard kettles. If you like the look of the Dualit 72402 Cordless Jug Kettle for its classic appeal but want something that's better suited to hard water areas, this is the kettle you need. The SAGE Compact Kettle is perfect for those who hate waiting for water to boil. As part of Heston Blumenthal’s kitchen range, the Compact Kettle allows you to boil as little as one cup for quick and easy results that also saves energy. Heston has kept on trend with a modern stainless steel design that features a German Schott glass window which gives you a full view of the water boiling. This gadget is small but technical and is the ideal addition to any eco-warrior’s kitchen countertop. If you struggle with worktop space in your kitchen, this is a great choice, and our best kettle for small servings. For those who simply want the best kettle for boiling water frequently, then the Kenwood kMIX ZJX750 is a solid choice. It's comfortable to hold when full thanks to it's curved and wide handle and with a 1.7L capacity, it’s perfect for big families or those that often have a house full. This kettle is reliable and will provide many years of service alongside a matching toaster should you wish to complete your kitchen’s look. If your household boils waters for tea and coffee more than a couple of times a day, this is the perfect everyday kettle. If you want the retro look with a modern boil, then this is the kettle for you. The KitchenAid Artisan Kettle has a beautiful design and can add efficiency to your country kitchen. We love this kettle for its variable heat settings that range from 50-100c. This allows you to tailor the temperature to different drinks such as herbal teas for the best taste. Its dual-walled construction also means you can keep water hotter for longer and it boils far more quietly than many other models on this list. The KitchenAid brand is a trusted one and this Artisan Kettle does not let the range down. If you often find yourself adding a splash of cold water to your hot drinks in order to get the ideal temperature for sipping, let this kettle take care of temperature for you.